I have got a new Mac and would like to transfer my existing Boot Camp partition from my old Mac to the new one. Can I do that with Parallels Desktop? 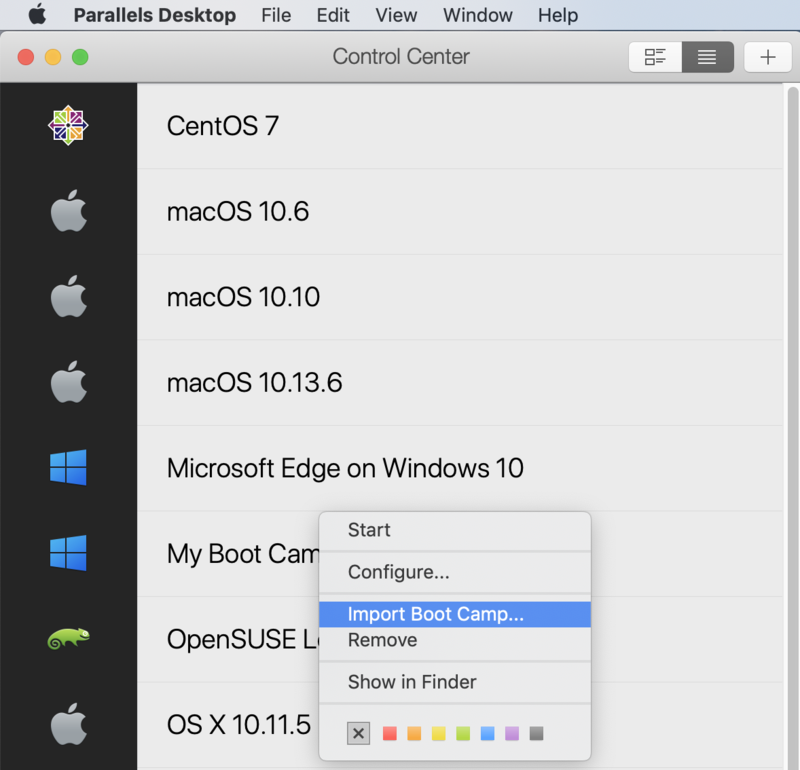 You will not be able to transfer your physical Boot Camp partition from one Mac to another using Parallels Desktop. However, you can import your Boot Camp partition into a virtual machine and then transfer Windows virtual machine to the new Mac. Create Windows virtual machine from Boot Camp on the old Mac using the instructions from KB 123314. Shut down Windows machine you have just created from Mac menu bar (Actions > Shut Down). Open Parallels Desktop Control Center clicking on Parallels Desktop logo on Mac menu bar and choosing it from the list. Right click (tap with two fingers) on Boot Camp machine and choose Import Boot Camp, then confirm it again by clicking Import. Choose the location on the Mac to put the virtual machine to > click Open, then wait until the import process finishes. NOTE: Once your Boot Camp is imported, you can still use the original Boot Camp Windows installation separately from Parallels Desktop. 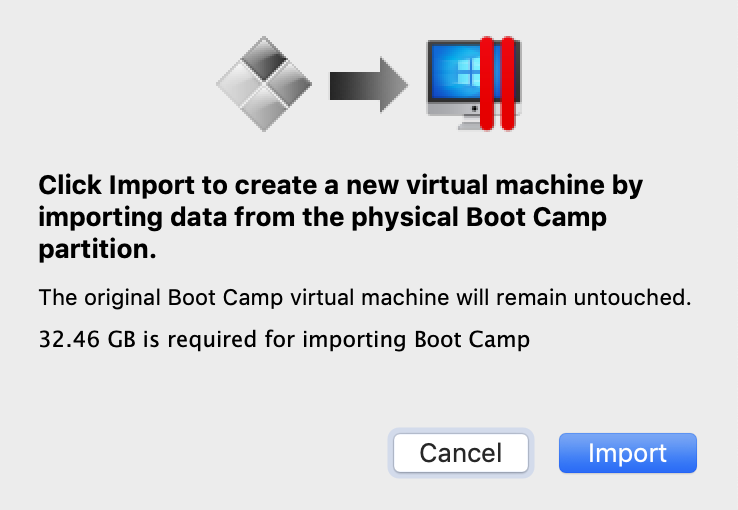 Locate the imported Boot Camp machine on your old Mac hard drive. Drag and drop this .pvm file on an external hard drive and wait for it to copy. Connect the external hard drive to the new destination Mac. Copy the .pvm file from the external hard drive to any folder on the destination Mac. 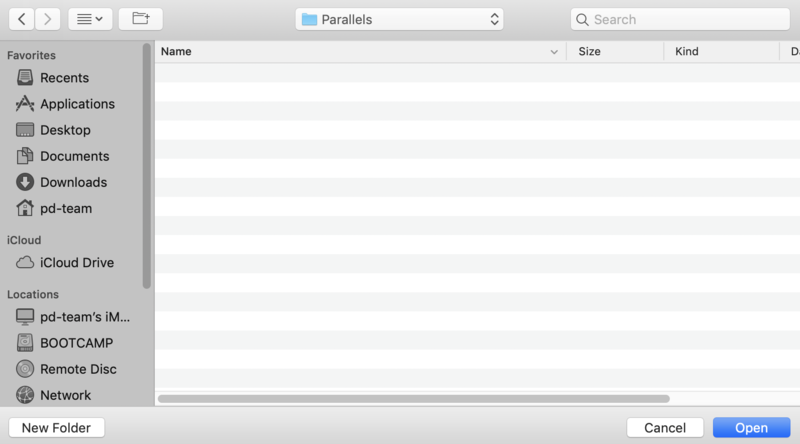 NOTE: The default folder for Parallels Desktop virtual machines is either the Documents/Parallels folder inside your user folder, or /<your user name>/Parallels. Double click on your .pvm file to register it in Parallels Desktop on the new computer and start Windows virtual machine.